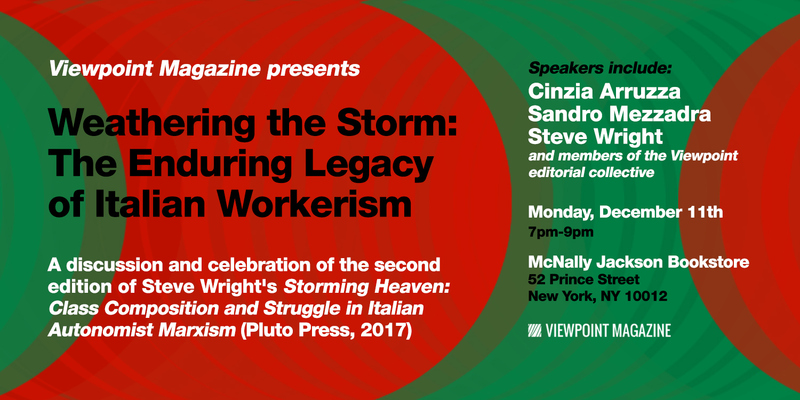 Viewpoint is proud to host Steve Wright, author of the monumental history of Italian workerism, Storming Heaven: Class Composition and Struggle in Italian Autonomist Marxism, for a roundtable discussion to mark the release of the book’s second edition from Pluto Press. On Monday, December 11th, join members of the collective along with contributing editor Cinzia Arruzza and contributing writer Sandro Mezzadra for a discussion with Steve at McNally Jackson Books in New York. The roundtable will explore how Italian workerist thought continues to inform political struggles and developments in Marxist theory today. Copies of the book will be available for purchase. You may view or share the Facebook event here.